Summary and Definition: The World War One Armistice between the Allies and Germany was the agreement that ended the fighting on the Western Front in Europe. The French word Armistice was taken from modern Latin 'arma' meaning ‘arms’ and 'stitium' meaning "stoppage". The WW1 Armistice went into effect on the eleventh hour of the eleventh day of the eleventh month on November 11, 1918. The armistice ended the actual fighting but it took another 6 months of negotiations at the 1919 Paris Peace Conference before the terms of the Treaty of Versailles were completed and signed on June 28, 1919. Armistice Day in the United States became a national holiday in 1926. Then in 1954, to honor the veterans of World War II and the Korean War Armistice Day was re-named as Veterans Day. Woodrow Wilson was the 28th American President who served in office from March 4, 1913 to March 4, 1921. One of the important events during his presidency was the WW1 Armistice. What Events prompted the WW1 Armistice? ● The people of Berlin rebelled on November 9, 1918 and forced the German Kaiser to step down. What does Armistice mean? The definition of the word Armistice is a truce agreeing to a temporary cessation of fighting and the use of arms. The word Armistice derives from the French-Latin words 'arma' meaning ‘arms’ and 'stitium' meaning "stoppage" and was a temporary suspension of hostilities while an attempt was made to negotiate a lasting peace. The signing of the WW1 Armistice with Germany began as an official German delegation arrived from Berlin to the Western Front at 10.30pm on Thursday November 7, 1918. The delegation made their way across the sector held by General Debeney and were recived bt Marshal Foch at the Allied General Headquarters on Saturday November 9, 1918. The German delegation were given the terms of the armistice and allowed 72 hours to accept or reject them. There was no negotiation process. On Sunday 10 November, they were shown newspapers from Paris to inform them that the Kaiser had abdicated. The terms of the armistice were accepted. ● Removal of all German troops from territory on the west side of the Rhine and occupation by Allied and US troops. ● Renunciation of the Treaty of Brest-Litovsk with Russia and of the Treaty of Bucharest with Romania. The WW1 Armistice with Germany was signed between 5:12 am and 5:20 am, Paris time on 11th November 1918. It was signed by representatives from Britain, France and Germany and brought 52 months of fighting in the First World War to a conclusion. 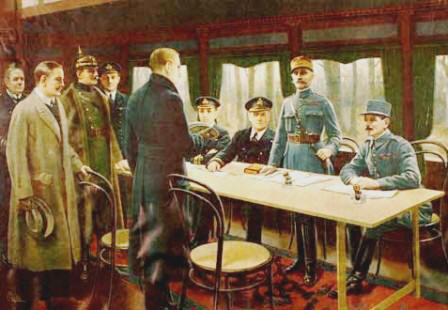 The signing of the Armistice took place in the private railway carriage of Marshal Ferdinand Foch, Supreme Commander of the Allied Armies, in the Forest of Compiegne, about 37 miles (60 km) north of Paris. Fighting in many sections of the front, including Americans fighting in the Battle of the Argonne Forest in the Meuse Campaign continued right until the appointed hour of the armistice. After the Armistice was agreed every effort was made to complete terms for a 'lasting peace'. 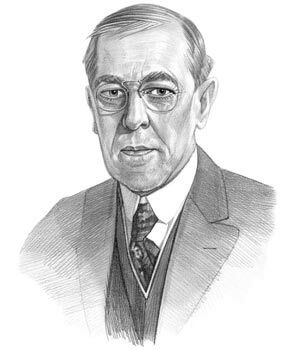 President Woodrow Wilson gave the Fourteen Points speech to Congress on January 8, 1918, declaring that WW1 was being fought for a moral cause and calling for peace in Europe. 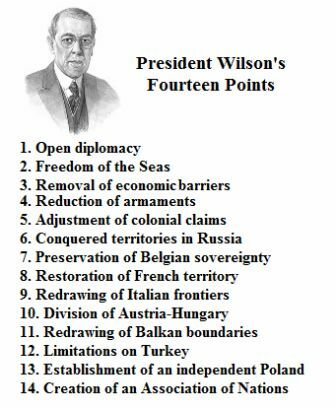 The 14 points of his speech covered Military and Territory changes and the creation of the League of Nations. The Fourteen Points essentially established the conditions for the armistices that had brought an end to World War I. The 1919 Paris Peace Conference consisted of 145 meetings over a six-month period to agree the peace terms. The top Allied leaders, the "Big Four", who met at the Paris Peace Conference were of President Woodrow Wilson of the United States, David Lloyd George of Britain, Vittorio Emanuele Orlando of Italy, and Georges Clemenceau of France. The Treaty of Versailles was finally signed at the Palace of Versailles in France on June 28, 1919. Armistice Day in the United States of America became a national holiday in 1926, its purpose was to remember all those who had fought during the Great War. Then in 1954, to honor the veterans of World War II and the Korean War Armistice Day was re-named as Veterans Day. A monument to those who had fallen during WW1 was dedicated in the Tomb of the Unknown Soldier at Arlington National Cemetery. The end of the horrors of WW1 ushered in a new era in which people wanted to enjoy themselves - it was called The Roaring Twenties. The article on the WW1 Armistice provides detailed facts and a summary of one of the important events during his presidential term in office. The following Woodrow Wilson video will give you additional important facts and dates about the political events experienced by the 28th American President whose presidency spanned from March 4, 1913 to March 4, 1921.